Streaking swiftly through Hell skies, their three Hisso engines thundering, we find The Greatest Trio of Aces! 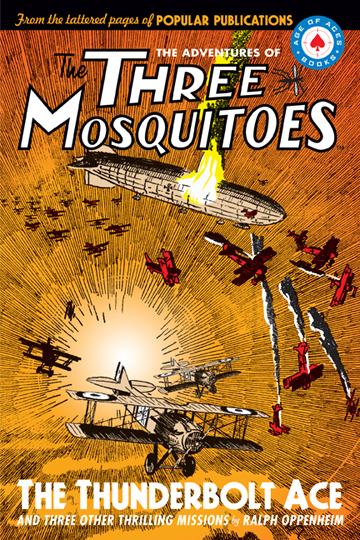 The famous and inseparable “Three Mosquitoes” were the mightiest flying combination that had ever blazed its way through overwhelming odds and laughed to tell of it! Captain Kirby, the impetuous leader of the great trio flew point with little mild-eyed “Shorty” Carn and lanky Travis, the eldest and wisest, filling out the “V” formation. With their customary battle cry, “Let’s go!”—they’re off on another dangerous mission in perilous skies! From the pages of Popular Publications’ air war pulp magazines, author Ralph Oppenheim brings us four more unforgettable adventures of this reckless trio from 1932 and 1933—so strap yourself in for adventure!